Before I get into the short-term wave structures and price projections, I am reposting my long-term chart, which I have updated to reflect my preferred view that Minor (1) down is officially complete. This chart is especially helpful for those new to Elliott Wave, as it provides a baseline to help understand my larger view of where the market is headed. Think of it as one of those "You Are Here" maps you find at the mall. 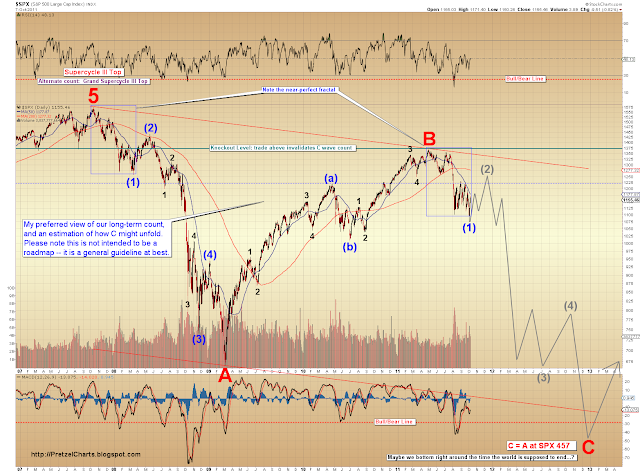 The article explaining the chart (as well as Elliott Wave Theory) in more detail can be found here. So the expectation is that we made a minor bottom at 1074, and we are now in the process of forming the first leg of what will ultimately be a three-leg (A-up, B-down, C-up) countertrend rally. 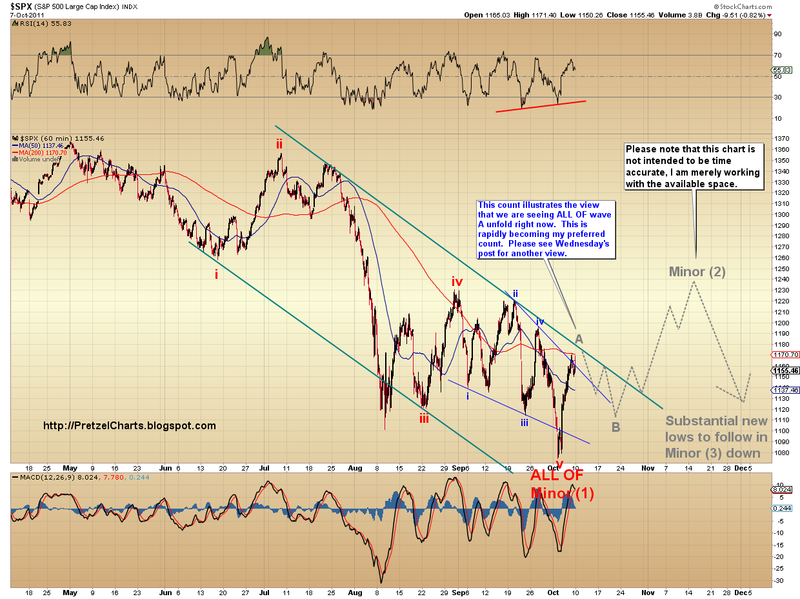 The three legs of this countertrend rally will combine to form wave Minor (2)-up. 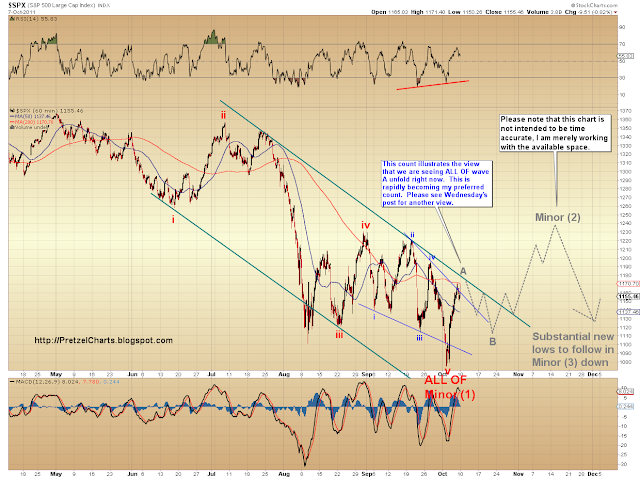 After Minor (2)-up completes, expect a waterfall decline to eventually form in Wave Minor (3)-down. Now, regarding shorter-term projections: there are a couple possible short term views for the current leg of this rally. My preferred view is that the S&P 500 will see a bit more downside (see 1-minute chart) before reaching up to tag the 1175-1187 zone. That down-up move would complete what I believe will be ALL OF Wave A-up of Minor (2)-up. After that, I would expect a larger correction in B-down -- although if we look at the long-term chart above and follow a similar track as we did in 2008, B-down might be more shallow than I'm anticipating. After B-down finishes, we should see one more good rally leg up toward 1245-1265 to complete C-up, and thus complete the entire Wave Minor (2) counter-trend rally. The alternate view says that Friday's high marked the top of the first portion of the first leg up and we will now correct down into the 1110-1135 zone before we see new highs for this move. This is the view which seems to be favored by most of the other Elliott technicians out there, however it is not currently my preferred view. One thing I have learned over the years is that most Elliotticians have a tendency to advance the wave degrees far too quickly. A good example to illustrate what I'm talking about would be my call from Wednesday, October 5th, when I stated "it appears that we are still forming the third wave of wave 1-up" -- most Elliotticians had already advanced their counts to place us in the fifth wave up on Wednesday, meaning the rally was nearly over (to be fair, in the past, prior to learning this lesson, I might have done the same). If we had been in the fifth wave going into Wednesday, the rally would have likely ended near 1150. Obviously, that view would have missed out on another 20+ SPX points to the upside -- and if my preferred count is correct, possibly even more. The other factor which plays into my decision to say this leg isn't quite done is the fact that the SPX shows a subdividing 1-2 series (October 4th) leading into the rally (see chart). Again, most technicians are labeling this whole structure as one wave -- but that labeling ignores a cardinal rule of Elliott Theory: wave 4 cannot cross into the territory of wave 1. To label the whole move as one wave, you must conveniently ignore the overlap of what would be waves 1 and 4 (labeled 1 and ii on my one-minute chart) -- so my view is that this structure is not wave one, it is a series of first and second waves. No doubt after all this explanation, I have virtually guaranteed that the other guys will end up being right, and I'll be wrong -- and my preferred count will get flushed into the toilet of stock market history, to become one more fetid mound of charts clogging up the septic tank of missed predictions. Murphy's law, right? Anyway, those are the two most apparent possibilities I see in the charts. For the record, I'm not ruling out the possibility that this portion of the first leg is over, I just consider it less likely. However, I considered it likely enough that I closed my ES longs (opened at 1105) at 1169 Friday morning. Whether this is the small correction I'm favoring, or the larger potential correction, positions can always be reopened when the market reveals its intentions. And, after all, cash is a position, too. Beyond that, the market has so far given us no reason to alter our preferred view that this is indeed Minor (2) up -- so after the next correction down, the rally should continue. 1) The preferred count (blue) is that wave 3-up of A-up of Minor (2) up has completed. We are now correcting in an a-down (blue a, completed), b-up (blue b, completed), c-down (labeled by the blue "4?" in process) to form wave 4-down of A-up. 4-down has fulfilled its minimum requirements, and may or may not be finished. Once 4-down completes, the market should then move to new highs to form 5-up and thus complete A-up. Once A-up completes, we should see a larger correction. 2) The alternate count (gray) is that we have completed ALL OF wave i or A ( whether this is i or A is to be determined) and are now in the process of forming either ii-down of A-up, or B-down of Minor (2)-up (again, to be determined. If this is i-up, it will be ii-down; if this is A-up, it will be B-down. The labeling is largely academic at the moment.). 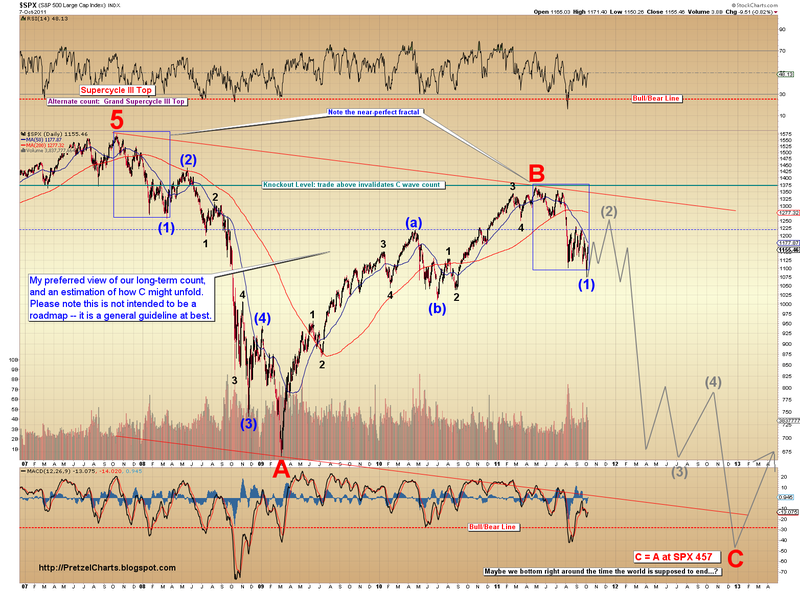 This coming bottom in the gray count would be immediately followed by a large rally. The 60-minute chart (2nd chart below) only shows the preferred count. Pretzel, you are saying that we are already done with A. Does that mean that you are anticipating C will be much longer in duration compared with A? pretzel, i had a little harder time following this post due to some confusing mixing of A and a's in charts and text. But what i got is, that you still project minor 2 completion somewhere in december at the ~1250 level for s&p-500 and from thereon it's downhill to minor 3. right? Arnie: thanks for the feedback. I sometimes forget I may be dealing with folks to whom Elliott labeling might get confusing. I have added an explanation of the charts at the end of the post. Please let me know if this helps clarify (or confuses further!). Thanks in advance for your input. I am suggesting that if the rally *does* continue as projected, we are most likely seeing ALL OF wave A unfold immediately. 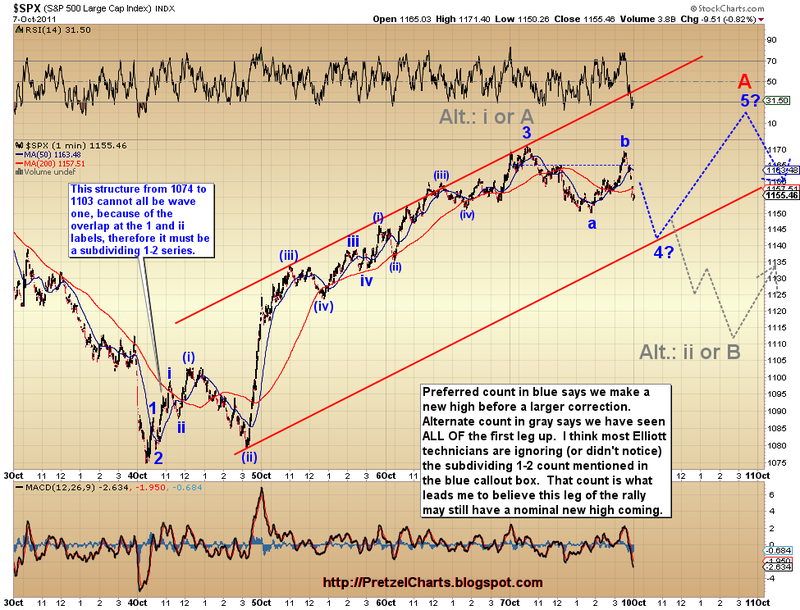 It is still possible it would be wave i of A, but I view that as less likely. If this leg of the rally is, instead, over already, it then becomes more likely that it's simply i-up of A-up. Personally, I track the wave structure first -- the time is what it is, and in my experience, trying to pick time-targets for Elliott waves is wrong more often than it's right. So I'll simply let the market dictate the timing as Minor (2) continues, and try to catch the top based on the structure.